Creative people know that they only do their best work when the conditions are just right. Some people are inspired by having other creatives to collaborate with, some work better surrounded by beautiful art or architecture, others may like to be near plant life, or may feel uplifted just by the way the sunlight streams through a window. But all require one essential thing – they need a space that allows them to play. Pablo Picasso said: “Every child is an artist. The problem is how to remain an artist once you grow up.” All this means that creating the right work environment can be critical to the success of any creative business. This article explores three multidisciplinary design teams (with a focus on graphics, interiors and architecture respectively) who have recently finished designing their own workplaces to find out what elements each one has considered essential to a creative environment. The interior of Architectus’ studio. Photo by Brett Boardman. 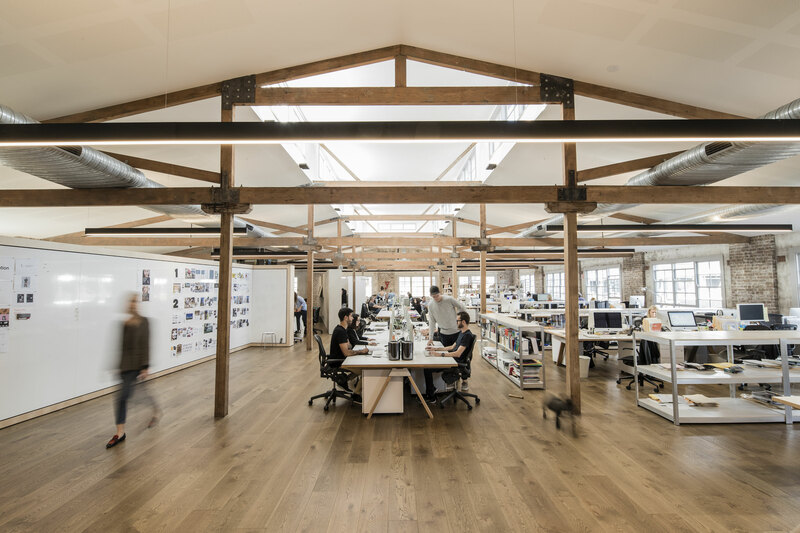 Run by Vince Frost, Sydney-based studio Frost*Collective has grown to include three major areas of focus – branding, digital and environments – requiring a shift from its Surry Hills premises to a new studio located at 16 Eveleigh Street, Redfern. Andy Carson was engaged to undertake an adaptive reuse of the site, which had previously been an old hosiery and handbag factory, and now is not only home to the new Frost*Collective space but also to digital marketer Massive Interactive, wine connoisseur, Cake Wines Cellar Door and concept café kitchen, Henry Lee’s. The common outdoor area at Sixteen Everleigh Street. Photo by Tim Jones. Different work zones are clearly defined despite the lack of physical partitions – instead, an organic screen acts as a layering device that denotes a sense of arrival and creates a flow of movement around the space. “We always invest time into understanding the flow of spaces within a creative workspace. Considering how these can best connect to one another and coming up with solutions to aid various levels of communication within a creative workspace is vital,” says Adele Bates. 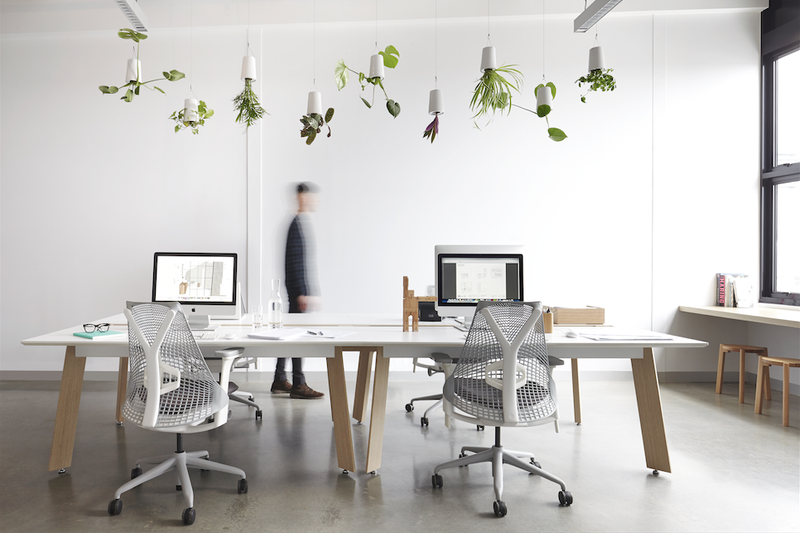 Aesthetic considerations, as well as health and well-being were also key to the design – the central work desk features a hanging plant feature above that acts as a kind of green canopy in the largely white space. “Our clients, staff members and collaborators all enjoy utilising the space. The studio feels calming and uplifting, which helps to promote the sharing of ideas and an ideal level of productivity within the studio,” concludes Bates. The Adele Bates Design studio. Photography by Christine Francis. 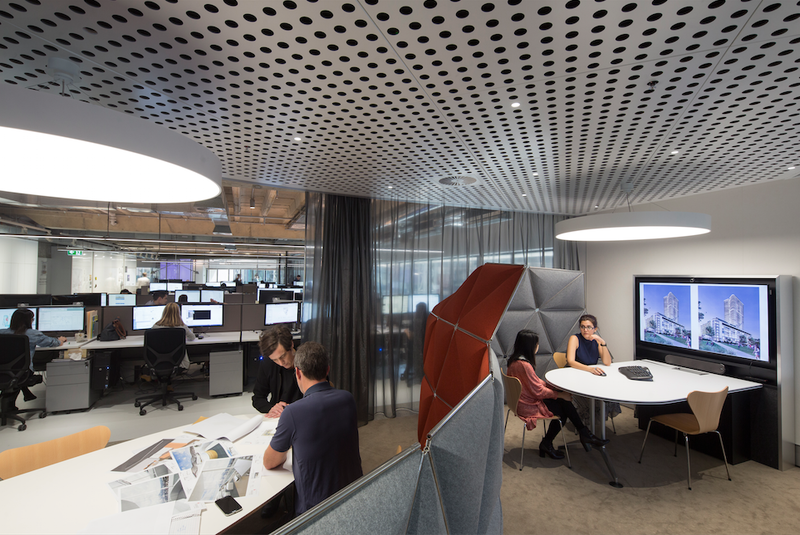 As a firm of workplace interior specialists as well as architects, Architectus was able to implement some of the latest technologies and workplace design theory into its own Sydney studio, located in the Harry Seidler-designed MLC building. Spread over 1153 square metres, the space includes products and systems that promote health and well-being – sit-to-stand desks encourage movement and good posture, while lighting is programmed to circadian rhythms so that it glows yellow in the morning and evening and is more blue in the middle of the day to match the quality of sunlight. 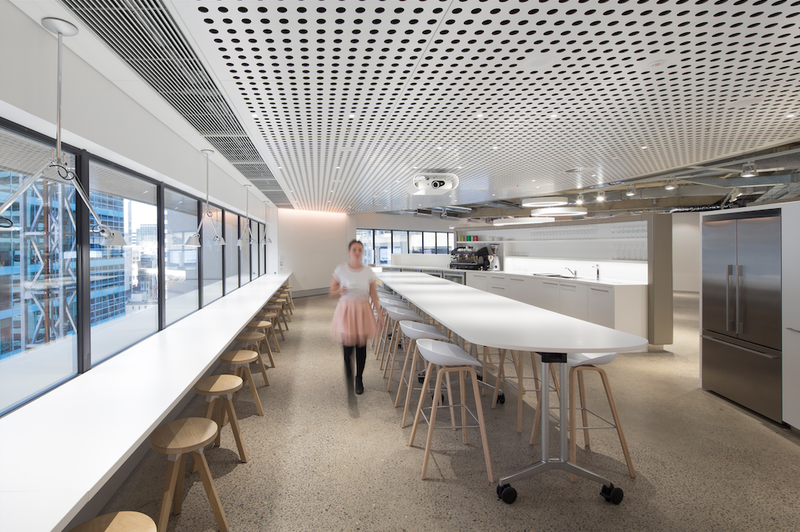 The space includes a variety of work settings, with moveable curtains providing some screening and plenty of quiet rooms, while the interiors were stripped back to reveal the architecture. “A lot more volume is created by not putting in a ceiling,” explains Ray Brown from Architectus. “It takes away from that potential of being a dull office environment.” Creativity is nurtured in the workplace through magnetic whiteboards used throughout as collaborative pin-up spaces, while video conferencing is available from every meeting room and all desks. Architectus has also implemented a policy where staff are asked to take a break from their desks for lunch and eat in the kitchen, which has created a social environment conducive to creative thinking – these behavioural changes truly activate the space. Lead image: The Frost*Collective studio, photo by Tim Jones. This article originally appeared in MEZZANINE issue 5. Subscribe to MEZZANINE at shop.niche.com.au or digitally through Zinio.